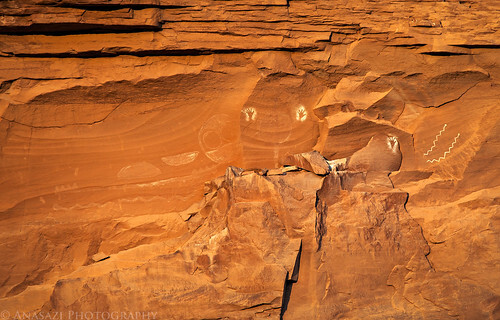 I first noticed this high pictograph panel in May when I backpacked to Peekaboo Spring in Salt Creek Canyon. Since I didn’t have my long lens on that trip (too much weight), I couldn’t get a decent photo of the panel. Since I was able to drive to Peekaboo this last weekend I was able to get a closer photo of this very interesting panel. I took this photo just after sunrise when the early morning light was striking it directly for only a few moments. Besides the very vivid reverse handprints and white zig-zag snakes, there is also an interesting large circular figure and two half circles that seem to have faded. Below those are a large white snake that is also pretty faded. The most interesting aspect of these pictographs is that they are painted very high up on a cliff with no current access to reach them…and we did try to find a way.